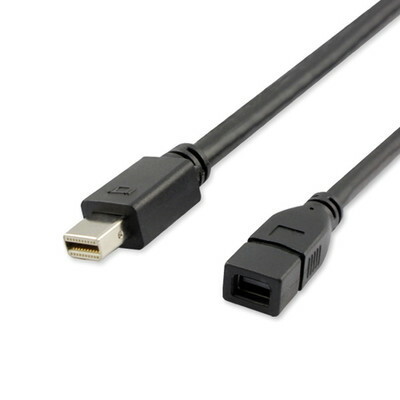 Our black 6 foot Mini DisplayPort male to Mini DisplayPort female cables meet the DisplayPort 1.2 standard, including but not limited to 17.28 Gigabit throughput. These cables have an aluminum mylar foil, braided shield and are RoHS compliant. This cable is used to extend a Mini Displayport cable you currently have that is just a little bit too short. Mini DisplayPort is a digital display interface developed by the Video Electronics Standards Association (VESA). The interface is primarily used to connect a computer video source to a computer monitor. Supporting a whopping 17.28 Gbit/s data transmission rate, this next generation audio/video cable is perfect for connecting your computer to your monitor. DisplayPort v1.2 technology allows for up to 2560x1600 video with 10-bit color, 8-channel 24-bit audio and a 1 Mbit/s bi-directional auxiliary data channel all in one cable. This Mini DisplayPort male to Mini DisplayPort female cable features heavy-duty PVC construction, sleek, a snag-free over mold and corrosion resistant, gold-plated connectors to help deliver years of entertainment content.